He didn’t catch a pass from Tom Brady this season. Nor did he take a handoff, make a tackle or throw a block. Yet the New England Patriots wouldn’t be in their fourth Super Bowl in five years without him. And don’t bother looking for him on the roster. He’s not there. Dante Scarnecchia, come on down. Scarnecchia is the Patriots’ offensive line coach and as important to Brady’s chances of winning an NFL-record sixth Lombardi Trophy as breathing is to you and me. Reason: Without him, Brady and the Patriots not only don’t win Super Bowl LIII; they’re not even there … and, no, that’s not hyperbole. That’s because Brady is the only quarterback who hasn’t been sacked in this season’s playoffs. Not once. Joey Bosa couldn’t get to him. Melvin Ingram, Chris Jones and Justin Houston couldn’t, either. So what’s new? Brady’s been sacked exactly five times in his last eight starts – or once less than Patrick Mahomes was vs. New England a week ago. But there’s a big difference there, and it looks like this: The Patriots don’t have an elite pass rusher or a great pass rush. In fact, their pocket pressure is downright mediocre, with only Oakland producing fewer sacks (13) this season. But Kansas City? The Chiefs’ defense tied with Pittsburgh for the league lead in sacks with 52. Yet they couldn’t get to Brady in five quarters of the conference championship game, and when you’re looking for reasons why New England piled up 36 first downs, was 13-for-19 on third-down conversions and cashed in on three third-and-10s in its overtime defeat of the Chiefs, start there. Then dig a little deeper, until you get the guy behind Brady’s protection, and that’s the 70-year-old Scarnecchia, whom Brady earlier this week called “the greatest offensive line coach in the history of the NFL.” That, of course, is subject to review, but Scarnecchia – who’s in his 33rd season with New England – is so valuable … or invaluable … to Team Brady that, two years after his retirement from the NFL, the Patriots in 2016 convinced him to return. They haven’t missed a Super Bowl since. That’s no coincidence. New England failed to reach Super Bowl 50 when Brady was pressured, hit, harassed and, ultimately, beaten in the AFC title game by a ferocious Denver pass rush that carried the Broncos to an NFL championship. 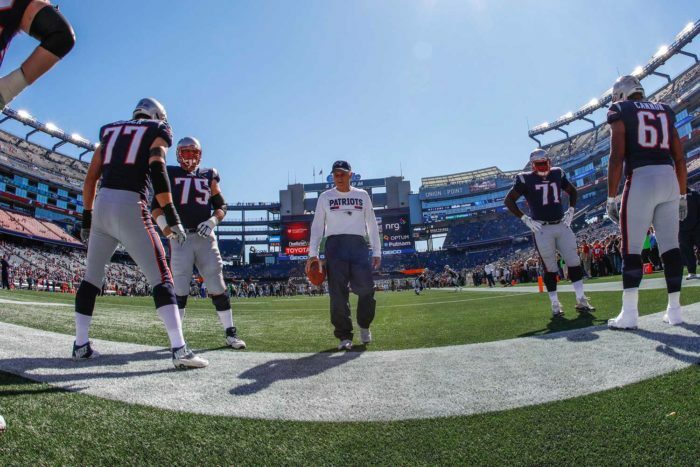 If the Pats were going to return to the Super Bowl, they knew what they had to do … and that’s find someone who could protect their greatest asset. So they did. They re-hired Scarnecchia, and look what’s happened. In his last four games, Brady’s been sacked exactly twice. Result: New England is 4-0, rushing for 273, 131, 155 and 176 yards, and, yes, there’s a cause and effect. The more the Patriots can run, the less Brady is hit. And the less Brady is hit, the more he looks like Tom Terrific as New England goes deeper into the playoffs. That’s not supposed to happen to 41-year-old quarterbacks. But then how many 41-year-old quarterbacks had the kind of protection that a Dante Scarnecchia affords? Good thing, too. Because Brady’s biggest challenge … and the greatest hurdle for Scarnecchia … awaits in Atlanta. In Aaron Donald, the Rams have more than just the NFL’s sack leader; they have the best defensive player in the game. Moreover, he’s teamed at defensive tackle with former All-Pro Ndamukong Suh, who’s chosen to play his best football of the season the past two games. Know-it-alls tell us that to rattle Brady you have to push the inside pass rush … essentially, get in his face with pressure. And while that’s accurate, it’s also accurate for all quarterbacks – which means it’s not exactly a revelation. Yet the Chargers couldn’t pressure Brady up the middle. Nor could Kansas City. And that was with Brady throwing 100 passes in two games. I don’t know that the streak continues. In fact, considering that Donald is on the other side of the ball, it’s reasonable to assume it doesn’t. But I’ve been around long enough never to say never. And I never thought I’d see a team blow a 28-3 third-quarter lead in a Super Bowl … until I did. All I know is that keeping Tom Brady clean again is critical to New England’s success, and if the Patriots’ pass protection can stone Donald, Suh and Dante Fowler as it did the Chargers and Chiefs, then we can all join in the chorus to celebrate New England’s not-so-secret weapon.